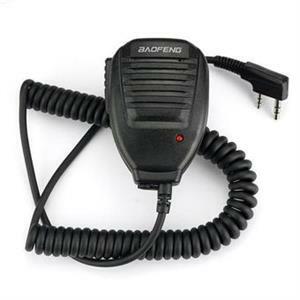 PTT Microphone for Baofeng, Kenwood, TYT, etc. Home > Commercial-Land Mobile-Marine > PTT-BK: Push-to-Talk Speaker microphone for Kenwood, Baofeng, Pofung radios etc. 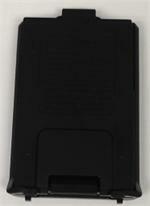 PTT-BK: Push-to-talk speaker Microphone - fits Kenwood HT radios, Baofeng radios, Pofung, Wouxun, TYT, Puxing radios, etc. 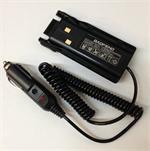 Has heavy-duty coiled cord, locking swivel clasp, and extra plug-in jack (for linking). Has LED indicator for incoming & outgoing signals. The dual-pin connector spacing & orientation is perfect for Kenwood, Baofeng, Wouxun, TYT radios, etc. Superb value ! 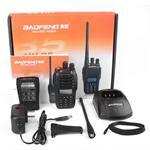 Works for business band / amateur band / police / search & rescue / fire deartment / military radios. Call us for special pricing on quantities of 100 or more. 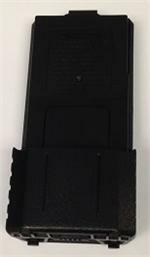 BL-6AAA: Compact 6xAAA Alkaline Battery Case for Baofeng UV-5R, UV-5RHP, UV-5RB, UV-5RE, UV-5RHP, TYT F8, TYT F9, and more. Load with 6xAAA Alkaline cells for instant power. 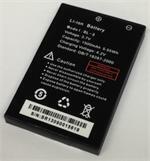 Replaces BL-5 battery. WEB SALE $ 9.95 ea. 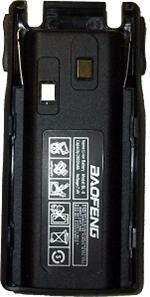 CBE-UV82 : Battery Eliminator for Baofeng UV-82 radio. Enables operation from a 12VDC socket. Has built-in voltage limiting and noise filtering circuitry. 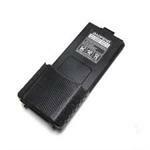 BL-8: 7.4 volt 2800mAh rechargeable Li-ION battery for Baofeng UV-82 radio. UV-B5: Baofeng dual-band (2m and 440), dual display 5W Transceiver package. NEW!! Full-function, digital display, 5W / 1W output levels. Also recveives FM 87-108MHz. 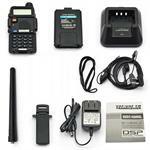 Includes Radio, Antenna, Battery, Belt Clip, Ear wrap & Mic, Charger, Lanyard.